Gil died at 0230 this morning New York time, surrounded by his family. He was 74 years old and had been diagnosed in October with an aggressive cancer. Gilbert Edmund Kaplan was a brilliant publisher who, aged 26, shook up Wall Street with a forensic, gossipy, must-read monthly called Institutional Investor. Before 1967 was out, he made his first million. In the same year, he became obsessed with Mahler’s Second Symphony, to the point where he had to conduct it. After organising a New York concert in September 1982, he became recognised as the world expert in the work. He acquired the composer’s autograph, published it in facsimile, and found so many errors in the printed score that he obliged Universal Edition to reprint it. More than 60 orchestras around the world invited him to conduct the work. Contrary to rumour, he never paid for any performances after the first four. 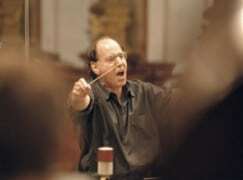 A centennial performance of the symphony with the New York Philharmonic in December 2008 was criticised in a blog by the orchestra’s second trombone player, but musicians on the whole learned from his interpretations and many maestros from Georg Solti onwards became close personal friends. He was a lovely man: warm, funny, loyal and brave. I spent time with him last month and treasure every moment of our friendship, which lasted half my life. He lived the second half of his life mostly for Mahler. So sad – I have lost a close friend of 30 years since we first met at the Salzburg Festival where I last saw Gil and his wonderful wife Lena last August. I treasure many unforgettable Mahler concerts and encounters from Vienna, Frankfurt, Bejing, Hamburg, Munich, Amsterdam, New York a.o. All my love dearest Gil! RIP…..His contributions to Mahlerdom will be missed. Clearly Sir you never had the pleasure and privilege of singing Mahler 2 for him. I did at the Royal Albert hall. It was inspiring. Since when do choristers sing *for* a conductor? Clearly you haven’t Sir. Your loss. What a joy it was to perform in the chorus for his Melbourne Mahler Two! Of course we sing “for”, and “with” and “led by” inspiring conductors. Kaplan was one such, scholarly, passionate, courteous, humble. Thoroughly memorable. He also hosted a wonderful radio series, Mad About Music, in which he interviewed a wide range of guests about their love of music. He will be missed. He was a person you met him only once and he left footprints in your life… I am sad but also thankful to met him and Lena last Summer in Salzburg… A sophisticated gentleman with a wonderful wife. I am so sorry for you Lena! Sending you my thoughts! Gil left the musical world a much better place because of his passion, searching for the truth and his commitment to helping others. He truly embodied all the positive aspects of the misused term, “Amateur.” We all learned so much from his scholarship as well as understanding how one person can change the way we think. Last evening, during a break in our New Year’s concert here in Detroit, I received a message from his beloved wife Lena. She wrote that the end was near. A few weeks ago, when Gil’s assistant Heidi Bryson presented me with a baton that Mahler himself had used to conduct the 2nd Symphony, it became clear that the end was near. With his family by his side, and unconscious for two days, Gil passed away a little after two in the morning. He was one of my very closest friends. I cannot begin to express how much I will miss him. This gentle soul, with the heart of a giant, will not be forgotten. When Gil gave his lectures about Mahler, they always ended with one song, “ice bin der welt abandon gekommen.” I know what I will be listening to today. We all at the International Gustav Mahler Society in Vienna are shocked. Thomas Hampson, our Chairman of the Board, e-mailed us immediately, he wrote “mit schwerem Herzen”. Gilbert loved to be in Vienna. During his last visit in June 2015 we had a long Mahler talk at Hotel Imperial and thereafter walked over to the Schoenberg Center, where he saw the manuscript of “Um Mitternacht” as well as Mahler related materials by Schoenberg. Also it was a privilege to have had masterpieces from his art collection on loan at the Albertina. With Gilbert we loose an exceptional Mahler expert, a reliable supporter of our society and a warm hearted friend, who immediately came up with brilliant suggestions when asked. Thank you Norman for your fast blog, and for your deep felt words. This is most appreciated. Our thoughts are with Gilbert’s wife Lena, with his family and the worldwide community of friends. We all will miss him. A man with a strong, true and genuine passion not only for Mahler, but for music in general.We had several conversations about music, especially about Mahler of course, and his knowledge about sources and style always impressed me. RIP. I am very shocked and saddened by the news of Kaplan’s death. I had a pleasure of meeting him in April 2014 when I had invited him to attend the world premiere of my orchestral reduction of Mahler 2. After the performance, we chatted a bit and talked about the similarities and differences in both our versions. I was hoping to see him at the premiere of my reduction of Mahler 3 last year but now I realize why he was unable to attend. We lost a wonderful person today and I send my condolences to his family. RIP. I can only imagine the pearly gates being opened for him to the strains of the M2. I was at the 100th anniversary of the American premier at Avery Fisher Hall in December 2008. Too bad it couldn’t have been at Carnegie Hall where the premier actually occurred but memorable nonetheless. I was fortunate enough to tape his question-and-answer session with the Mahler Society of Los Angeles on July 2, 1995, at the home of Mahler expert William Malloch. This was just prior to his conducting Mahler 2 at the Hollywood Bowl. Noticing my tape recorder, he said he hoped I wouldn’t make public his preferences for Mahler conductors. I never did but I think I can disclose these now. His two top choices were Tennstedt and Horenstein. After these, there were Solti, Rattle and Bernstein. What about Bruno Walter? Kaplan said that Walter was a “marvelous” conductor, but he didn’t feel Walter’s Mahler Second got through to him. A big point Kaplan hammered at is that many conductors accent the first note of the Second. Instead, there’s a slight tremolo and then a big HARRUMPH like a wave coming in. Those of us who were at the session were unaware that William Malloch had terminal cancer. He passed away 6 months later. So sorry to read of the premature death of Gilbert Kaplan. I sang in the chorus on his first recording of Mahler 2 with the LSO and Maureen Forrester in St David’s Hall, Cardiff. As I recall, he hired both orchestra and hall for a week and, when he was dissatisfied with his reading of the last movement, he hired them again for one or two days. The LSO seemed to enjoy themselves and warmed to him as did we, the choir. He was courteous, precise, unpretentious and warmly enthusiastic. No wonder the orchestra made a presentation to him at the end of the week. By contrast, I was told that the VPO were very snooty with him when he came to make his second recording of M2. Professionals and amateurs alike we responded to enthusiasm and his humanity. Norman – I have just remembered that the sessions in Cardiff were filmed and the film shown on BBC 2 tv, though whether it was a BBC production I cannot say. Do you know of anyone who might have it in their archive? Possibly even you? From the obituary in the telegraph. I had no idea he was brother to Joseph “You Light Up My Life” Brooks. A huge loss to the arts world. Met Mr Kaplan and his wife once at a restaurant in midtown Manhattan. They couldn’t have been friendlier. Very sad news. I, too, was deeply saddened to hear this, although I only had one encounter with him. He was in Stockholm in 1974 or 1975 and requested a meeting with me (this was in BIS’s second year of existence). We had an extremely nice chat for a couple of hours and he told me all about his obsession with the Mahler 2, a work that I had performed as a chorister several times. I could but agree with him. Anyway, when he told me about his plans to conduct it and have it recorded, I failed to deliver the enthusiasm I, with hindsight, should have done, and the contact fizzled out. That may have been the biggest boo-boo of my whole career as a record producer. Aw, shucks, take away the “may”. RIP – Gil. Mitt största medlidande, Lena. In addition to Gil’s intelligence and creativity there was a sweetness in the man, always kind, always interested in his friends. He lived many lives and perhaps that is why he left us so quickly. He packed them all into his chronological 74 years but he really lived to 150. The world is more drab, more sad, without him. Anyone who had been transported in awe, by Mahler’s Second Symphony, to a higher spiritual realm, had an understanding friend in Gil Kaplan. His lectures left a majority of their audiences in heartfelt tears of appreciation for Gil’s unique ability to carry us to a better understanding of the music and the man. We have lost a true and loyal friend. An unforgettable man of passion and vigor for music. Respect and humility towards the greatness that is music and a fierce protective nature in its defense. I adored him and will forever count it one of the blessings of my life to have known him and called he and his wife friend. He introduced me many years ago to you and to many fabulous accomplished lovers of music. People of great knowledge and world success flocked to be near him. To Lena, a great and beautiful lady of considerable beauty and charm, a great and honest soul, and her whole beautiful family and to the music work at large I offer my deepest condolences. He is in a world now that will confirm his delight and awe of music. A world filled with oceans of light and melody and the conversations ? How great they will be. God bless you dear Gilbert. Gil. Thank you for it all! The world of Mahler has lost a genius. In 1982 I was invited by Gil to his concert at the Avery Fisher Hall in NY. From that day I was a different person musically speaking. 33 yrs after that incredible performance, I decided to do the same he did. To conduct the Second Symphonie (without knowing music). Gilbert inspired me and introduce me in the magic world of Mahler. Last February the 7th, Gil give me a three hours private lesson about the Resurrection at his NY apartment. The same that George Solti did with him sometime before his debut in 1982. He finished telling me: “You can do it”, and I did. Last March the 26th, thanks to this great man I conduct the 2nd and 4th movements of the Second Sympohie at the Palau de la Musica in Barcelona Spain. Mid November I published a book: “The equation formula and Mahler. Challenges in life”. In that book I explained my relation with Gibert about this event. I send him the first copy been published, end november, but probably too late. Maybe his wife Lena will read it. From Gil I learned that with passion and effort nearly everything is posible in this life. As great as Mahler no. 2 is, too bad he didn’t devote his life also to a handful of Haydn and Mozart symphonies. How wonderful that would have been. Some years ago I sang the Mahler 2nd with Gilbert Kaplan in NYC. That year he was asked to give the Westminster Choir College commencement address at the Princeton University Chapel. My father had worked for Ashland Oil for many years, but when the plant he worked for closed he was without a job at the age of 50. My mother was going to attend the commencement. As she was starting to back the car from the driveway for the journey, my father said, ”Wait a moment!” He ran inside then came out with a resume in hand. My mother said, ”Bill, I don’t think I’m going to any oil companies or refineries in Princeton.” He asked her to take it just in case….he really wanted and needed good employment. My mother found the commencement address about making dreams come true to be very inspirational. Her dream at the time was for a good job for my Dad. After commencement she nervously approached Mr. Kaplan, and with a shaking hand offered him that resume. She spoke with him briefly, explaining her dream. He said that the CEO of Asland Oil was a friend and that he would call him. Two days later my father was contacted by that company and two weeks later began his new job. This act of kindness and generosity made so much possible for my family. We are forever grateful to Gilbert Kaplan and shall always consider him to be a great friend. Rest in peace, Maestro. Thank you for this beautiful reminiscence, so typical of the man. I was very surprised and saddened to hear this news. I first met Gilbert in Jihlava in 2010, shortly after I had dug up a new photo of Mahler conducting a rehearsal for the premiere of M8 in Munich. In the following years we maintained an e-mail correspondence in which we discussed new finds concerning Mahler’s time in New York as well as other other recently unearthed photographs of the composer. We also talked about some of these finds in person several times when he kindly received me at his New York office. Just a few months ago we had been planning to get together in Ho Chi Minh city in Vietnam, where he was scheduled to conduct his version of M2 for reduced orchestral and choral forces. I had already purchased my tickets from Phnom Penh when he informed me in August that the local orchestra had backed out of the project feeling that they would not be able to prepare the work adequately in time for him to conduct the two performances in early November. That was my last contact with him. Gil was a true Mahler enthusiast who did a great deal to promote Mahler the man as well as his music, including through his evening courses on Mahler at Julliard. I regret that I never got to experience his Mahler multimedia presentation. He also invested in some important Mahlerian manuscripts which he has made available through facsimiles — I believe that a facsimile of “Ich bin der Welt” was due for release recently. And of course he funded the re-publication of Knud Martner’s “Mahler’s Concerts”, which had been just about impossible to obtain in its earlier incarnation. Mike, is that the photo that’s now in the second edition of “The Mahler Album”? Regardless, where and how did you find that photo?!? I once had lunch with Mr. Kaplan – with others, sponsored by BMG – and he simply couldn’t have been more nice or more sincere. He also had a very funny story about the offstage brass in Mahler 2 from one of his overseas concerts that I think might not be appropriate to tell in full. But it made me laugh like crazy. I really like his DG recording of the revised edition – paid for by the Kaplan Foundation – that was performed by the Vienna Philharmonic. I’m hoping that more conductors will use that edition. Almost exactly 20 years ago, back in March 1996, I met Gilbert Kaplan in Vienna, when he was going to conduct Mahler’s 2nd symphony with the Millenium Choir and the Orchestra of the Vienna Music University (then still called „Hochschule für Musik und Darstellende Kunst“) on the occasion of Austria’s 1000 year anniversary (you find the program of the performance on the Wiener Konzerthaus website). My colleagues of the Hugo Wolf Quartett have been on the principal positions of the 2nd violin, viola and cello, I was his concertmaster. I remember him as a very kind person, who – although aware of his limits in conducting technique – could clearly project his vision of this masterpiece based on his deep knowledge of the masterpiece, which resulted in an exciting, unforgettable and enthusiastically received performance. R.I.P. As someone who only knows media accounts about Gilbert Kaplan, I would be very interested to learn, WHY he was so “obsessed” in a passionate and productive way with particularly Mahler’s 2nd Symphony. I read an account where he describes vaguely a musically uplifting moment of epiphany when hearing the piece in his youth. But I wonder if the complex and unique syncretistic qualities of the composition were of special interest to him? A trumpet player friend was driving me up Highway 32 in the hills above Chico, Ca. He had an 8-track cassette of Mahler’s “Resurrection” symphony conducted by Leopold Stokowski (RCA). Being a brass player, I was naturally drawn to Mahler’s incredible brass writing. In the finale, there’s a moment where the unison horns (9 of them) play an ascending theme that could subjectively be described as ‘mountainous’. At that very moment, we turned a corner and there was Mount Lassen in all its snow-capped glory! From that instant on I was hooked. I too bought the 8-track copy of Stokowski’s “Resurrection” and played it full-blast all around Chico in my green 1970 Camero. Some people must have thought me insane. Lovely. Still have the car? I got hooked to Mahler’s world at a much younger age as a choir boy in Mahler VIII. I’m asking because for me the 2nd signifies that struggle Mahler had with defining his identity in a secularized yet fragmented world at the fin-de-siecle. Ancestors Jewish. Himself secular with a fundamentally free and pantheistic spirituality. Thrown back on his Jewish roots more involuntarily than by outside discrimination issues than by inner connection. Converted to Christianity, for opportunistic career reasons, to appease the supreme watchdogs more than by conviction. So I was wondering if the late Mr. Kaplan felt compassionate about that particular struggle of a free spirit in an ideologically constrained world, to which the 2nd is the best testimony. Apparently Mr. Kaplan was not religious or at least did not make any waves in public about his convictions. In a way that one actually wonders. There’s a somewhat famous story along those lines, and I’m not so sure that it doesn’t involve Mahler. It goes something along the lines of . .
A famous musician was being interviewed and was eventually asked about his religious beliefs. He replied simply, “I am a Musician”. By the way, the 1970 Camaro is long gone. The memories aren’t.